Lesson plans for many of the modules we use can be found in our lending library of experiments. If you don’t find the right activity for your classroom, let us know. We might be able to suggest an appropriate one or even develop a new module to help meet your needs. Every effort is made to align the hands-on modules with New York State’s Learning Standards for Math, Science and Technology. 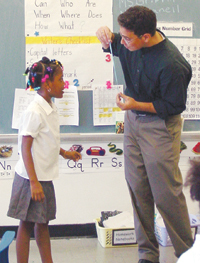 States of Matter module with 1st and 2nd graders at the Ithaca Montessori School in Ithaca, NY. Simple Machines module with 3rd graders at Immaculate Conception School in Ithaca, NY. Buoyancy module with 4th graders at Dryden Elementary School in Dryden, NY. Magnetism and Motors module with 4th graders at St. Mary’s Elementary in Cortland, NY. Water Bottle Rockets module with 5th graders at Lansing Middle School in Lansing, NY. Light and Spectroscopy module with 6th graders at Promise Academy I Middle School in Harlem, NY. Rube Goldberg Machines module with 7th and 8th graders in an afterschool program at Boynton Middle School in Ithaca, NY. Self Replicating Robots talk with the Science Club at Nottingham High School in Syracuse, NY. Energy and Fuels Cells talk and module with Juniors and Seniors at John Marshall High School in Rochester, NY. All presentations are free of charge and available to not only classroom teachers, but afterschool and community groups as well. If you would like to request a visit to your classroom or afterschool program, please contact the outreach office at (607) 255-1486 or email us at ccmr_outreach@cornell.edu.